I was probably about eleven years of age when I first played Godzilla Monster of Monsters on a friend's NES. We were both pretty excited at the prospect of controlling the radioactive monster from the depths, having seen more than a few Toho films by this point. What we got was a confusing mess. The map was confusing to us for some reason, possibly its hex-based design (it would be another year or two before I delved heavily into board games where such things are common). And the game gave very little direction to what should have been a simple affair: Control Godzilla, wreck s--t.
After that first experience, Godzilla was tainted in my mind. It was a "bad game" for many years and I would groan at the sight of the cartridge. Maybe I'm wrong, though, and merely prejudiced against something I simply didn't understand. In the year 2XXX, Planet X declares war on the Earth. Sending their space monsters to conquer our planet, the only ones who can stop them are Godzilla and Mothra. In the game you control the two monsters as they try to defend Earth in a battle which spans across the solar system. Godzilla combines a practically non-existent strategy game with very simplistic action levels. 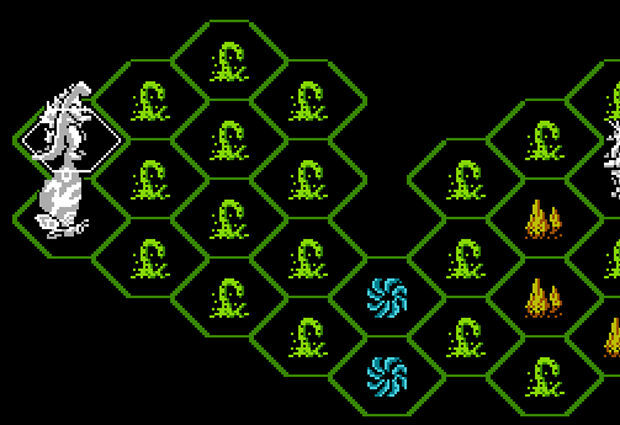 Starting on a hex-based world map, players can move Godzilla or Mothra across the surface of whichever planet they happen to be fighting on. Mothra, having the capability of flight, can move twice the distance of her reptilian compatriot. 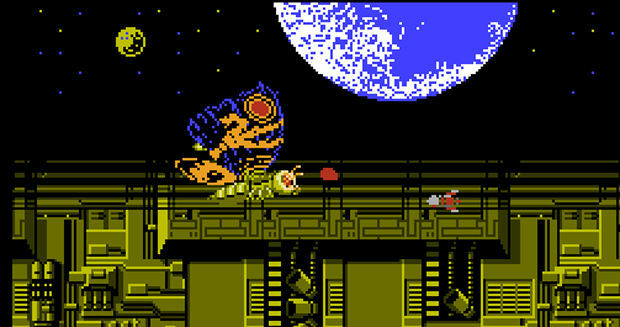 Once you have moved one of your monsters to a new hex, the game shifts to a side-scrolling perspective. These are action sequences which represent the travel distance that you've moved your monster on the map. Each screen is representative of a hex that you've moved to, and the environments change depending on the type of terrain in the hex. The monster you have moved is the one that you control in the levels. Mothra has great maneuverability but a very weak basic attack which fires a small ball of energy. 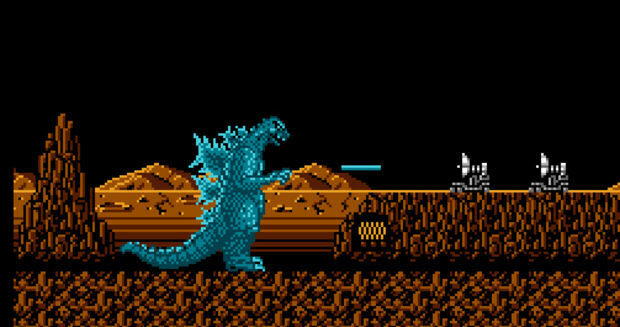 Godzilla may be stuck on the ground but has a much larger repertoire of attacks, able to punch, kick and perform a tail swing. In addition to their basic combat maneuvers, the two heroic monsters each have a special attack and are limited in their use by a power meter. Mothra releases poisoned quills which drift down to the ground. They are practically useless, as they don't have much in the way of forward momentum and there's rarely enough space on screen to get above the enemies you'd want to take out this way. Godzilla's radioactive halitosis, however, is very effective at dishing out the hurt but takes a long time to recharge. Honestly, none of it works too terribly well. The monsters move about as clunkily as they do on the silver screen and attacks are often less than responsive. On the plus side, because you are a massive beast, you're built to take damage. Most levels are really just a matter of moving to the right and pressing the attack buttons until you reach the other end. After your monster has traveled across the land and reached the hex-space you commanded them to move to, the turn ends. Then, an enemy monster moves and will attack you if they can reach Godzilla or Mothra. 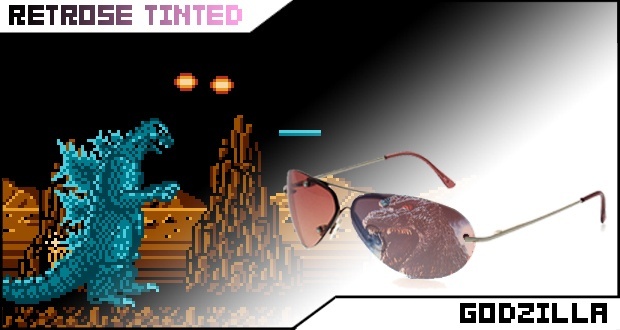 Play continues in this vein, with monsters moving and fighting, until all of the enemy monsters have either been defeateded or have fled from whichever planet you're on. At this point, players have to get Godzilla and Mothra off the planet and on to the next one. All which needs to be done is moving both of the monsters to the farthest point to the right on screen. It's beyond tedious, as you are still limited by the movement limits on the characters. If you have to travel the entire length of the board as Godzilla, only able to move two spaces at a time, it becomes very droll. The upside to all of this traveling is that the game features a basic experience system to make your monsters more powerful. The amount of health and special attack power the monsters have increases as you gain levels. It's all based on score, so the more points you accumulate by fighting your way across the solar system, the better your chances of surviving against some of the tougher monsters on later planets. That's pretty much the whole of the game. You wreak havoc across a planet's surface until you fight a giant monster or three, then move on to the next world. It's not terribly interesting after the second planet or so and the levels can get downright ridiculous, throwing out tiny enemies which cannot be easily destroyed but will quickly drill down your health on contact. Nothing particularly special here, yet I keep thinking about the game and occasionally boot it up just to see how far I can get. Despite the appearance that the map screen might give, there's no deep strategy at work here. Just mindless, relaxing carnage.